1. Wine with a Sacred History, author Tony Hendra will discuss the influence of Benedictine monks on the history and development of wine at a discussion and tasting presented by the Stony Brook Center for Wine, Food, and Culture, Wednesday, September 28, at Stony Brook Manhattan, 401 Park Avenue South at 28th Street. $55.00/person (631.632.9404). 2. Oyster Shucking Demonstration, Aaron Bashy, chef/owner of The Minnow, will demonstrate how to shuck oysters, Saturday, October 1, 10:00 a.m. to 12:00 p.m., at the Grand Army Plaza Green Market, located at the northwest entrance to Prospect Park, at Flatbush Avenue and Eastern Parkway in Brooklyn. 3. Urban Harvest, two events comprise Slow Food USA's annual Urban Harvest event featuring artisanal producers from the New York region. "New Amsterdam Market," on Sunday, October 2, 10:00 a.m. to 2:00 p.m., at the New York City Municipal Building Arcade, 1 Centre Street, will feature tasting plates (free admission, $20/6 tasting tickets). Later that day, from 2:00 p.m. to 5:00 p.m., "The Spirits of the Region," a tasting of wines, beers, and ciders, will be held at the Institute for Culinary Education, 50 West 23rd Street. $65/person, $55/Slow Food members (718.260.8000). 4. Cooking Demonstration: Heavenly Honey, chef Alyson Crispi will demonstrate cooking techniques using honey, preparing a rustic honey polenta cake and Moroccan honey spiced hummus, Sunday, October 2, 2:00 p.m., at Wave Hill, West 249th Street and Independence Avenue. Free with admission to Wave Hill (718.549.3200). 5. Chile Pepper Fiesta, The Brooklyn Botanic Garden will present a chile festival, Sunday, October 2, 12:00 p.m. to 6:00 p.m., 1000 Washington Avenue, Brooklyn. Rain or shine. 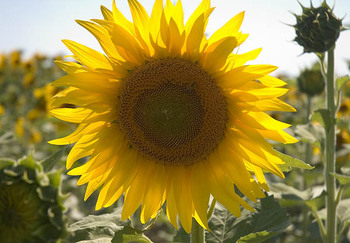 Free With Garden admission (718.623.7200). 6. New York City International Pickle Day Festival, the Lower East Side Business Improvement District and the NY Food Museum will present the fifth annual Pickle Day, featuring pickle samples along with pickling and home canning demonstrations, Sunday, October 2, 11:00 a.m. to 4:30 p.m., Orchard Street between Houston and Stanton Streets. 1. Baking Chat, Pastryscoop.com will host an online chat with Melissa Murphy of Brooklyn's Sweet Melissa Patisserie, Wednesday, September 21, 12:00 p.m. to 1:00 p.m.
2. Harvest in the Square, the tenth annual fundraiser and tasting event at Union Square will be held on Thursday, September 22, 7:30 p.m. to 9:30 p.m., at the Northern Plaza of Union Square Park. $85/person in advance, $95/person on the day of the event (212.460.1208). 3. Afternoon Tea & Tour: Where Pinkies Find their Purpose, a traditional English three-course afternoon tea will be served in the garden of the Merchant's House Museum, Sunday, September 25, 3:00 p.m., at the Merchant's House Museum, 29 East Fourth Street. $50/couple, additional guests $20 (212.777.1089). 4. Native Grapes of Southern Italy, a tasting of wine varietals from Southern Italy, including Falanghina, Fiano, Cesanese, Aglianico, Uva di Troia, Negroamaro, Inzolia, Nero d’Avola, and Gaglioppo, Monday, September 26, 6:30 p.m., at Vinoteca, 143 East 27th Street, between Lexington and Third Avenues $65/person (212.725.6516). 5. The Joy of Sake, sample 210 sakes at this tasting event billed as "the largest sake tasting event held outside of Japan," Tuesday, September 27, 6:00 p.m. to 8:30 p.m., at The Puck Building, 295 Lafayette Street. $75/person (888.799.7242). 6. Restaurants for Relief, Share Our Strength, OpenTable.com, and Windows of Hope will present a national one-night "dine around" on Tuesday, September 27, to support the victims of Hurricane Katrina. Participating restaurants will designate a portion of proceeds from the the evening's sales to be donated to Share Our Strength’s Hurricane Katrina Relief Fund. Named for a region in Southwest Tuscany regarded as Italy’s Wild West, Maremma is Casella’s tribute to the Italian Spaghetti Western and features a whimsical melding of Tuscan and American cowboy fare. "Maremma and the American West are so alike that I thought it would be fun to bring the foods together to create a 'Spaghetti Western' cuisine," says Casella. Throughout history, Maremma, a beautiful, rugged terrain on the Southern coast of Tuscany, has been a haven for bandits and i butteri, Tuscan cowboys. The region was also part of the inspiration behind many of the Italian Spaghetti Westerns of the 1970’s that were Casella’s favorites to watch growing up. Even today, Italian cowboys roam the vast land with their big, sturdy maremmano horses, herding long-haired maremmano bulls. We didn't see any Tuscan cowboys, much less long-haired bulls on our visit. And while the sparsely settled rural area surrounding Grosetto has a quiet, frontier feel (if you can see past the terraced vineyards and olive groves), the Wild West analogy seems a little anachronistic, at least based on our experience. After all, as we exited the main highway, we were greeted by a huge billboard advertising "Golf and Cashmere," and the countryside is studded with the kinds of agriturismos familiar to any visitor to Chianti. Megalo-restaurateur Alain Ducasse has thrown his hat into the ring by opening an over-the top resort hotel to woo elite travelers to the region. 1. Circle of Taste, a series of special dinners and tasting events at the Time Warner Center at Columbus Circle will continue from Monday, September 12, through Saturday, September 17. Full schedule of events at circleofttaste.com. 2. The Future of Food, a documentary film about the rise of genetically modified foods, will premier on Wednesday, September 14, at the Film Forum, 209 West Houston Street, with additional screenings through September 27 (212.727.8110). 3. New York State Wine & Cheese, pairings of cheese and wine produced in New York State, Wednesday, September 14, 6:30 to 8:00 p.m., at Murray's Cheese, 254 Bleecker Street. $50/person (212.243.3289, ext. 25). 4. The Global Food & Wine Experience: Bridging Cultures, Wines & Cuisine, tasting event benefiting the Black Culinarian Alliance, Thursday, September 15, 6:30 to 9:30 p.m., at Chelsea Market, 75 9th Avenue. $45/person in advance, $60/person at the door (646.548.2949). 5. Autumn Moon Festival, get your moon cakes on at this annual holiday festival marking the 15th day of the 8th month of the lunar calendar and the abundance of the summer harvest, Sunday, September 18, on Mott Street between Bayard and Canal Streets. The event will feature moon cake tastings and a "riddle contest," among other festivities. Free admission (212.484.1263). 6. 78th Annual Feast of San Gennaro, the annual street festival will begin Thursday, September 15, and continue through Sunday, September 25. Festivities include a Cannoli Eating Contest, to be held on Friday, September 16, from 2:00 to 3:00 p.m., at the Feast Stage at the intersection of Grand and Baxter Streets (212.226.6427). As the flood waters recede, Amy Evans has promised to keep us up to date on the fate of New Orleans. So, check back for updates once more information can be gathered about the city's citizens, its cultural institutions, and its future. In the meantime, you can find her entire series on the Bartenders of New Orleans at the Southern Foodways Alliance. You can also find more information about the artist, photographer, and oral historian at amycevans.com. Originally from Mississippi, Floria Woodard headed to New Orleans seeking opportunity. She found it as server at The Court of Two Sisters (the first African-American server at that), but she eventually set her sights on the bar. 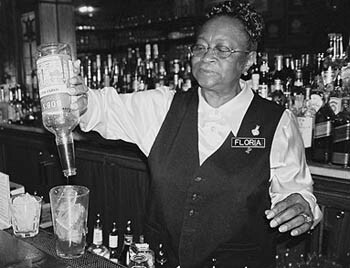 Thirty-eight years later, Miss Flo is still behind that bar, serving cocktails to the locals and returning tourists who seek her out at this well-known French Quarter restaurant. In the wake of Hurricane Katrina, Miss Flo’s story resonates. Hers is the story of an African-American woman from Mississippi, who set out on her own to find a job and make a new life for herself. She ended up in New Orleans, and the service industry answered her call. The state she left—the state of Mississippi—is where I live today. It might also be the state that Miss Flo returned to in order to escape New Orleans and Katrina. We can only hope. The city of New Orleans has long been compared to the Italian city of Venice. Both places were built on watery slabs, defying common sense, yet stimulating our imaginations. Still reeling from the storm, I am forced to think of New Orleans’ sister city and of the power of water meeting stone. The Basilica San Marco is the jewel of Venice, but its arches and domes weigh heavily on the piazza, tons of marble and bronze slowly sinking into the canals. Inside the basilica, hundreds of years of floods and high tides have left their mark. Watery forces have pushed on these floors so regularly and for so long that you feel drunk just walking through the door, solid waves of marbled mosaic fooling your eyes and feet with each step. Perhaps the waves have tired of Venice, and they have finally come to push against New Orleans. Waves of immigration have brought scores of Italians to the Crescent City and other parts of the South for generations, and New Orleans was where a good many of them decided to put down roots. The Casamento family was one of those families. In the early part of the twentieth century, Joe Casamento arrived in New Orleans and opened a restaurant on Magazine Street, putting his family name above the door. Serving fresh seafood and above all, fresh oysters, Mr. Casamento quickly established a reputation for serving some of the best seafood in town. 1. Save New Orleans Cocktail Hour, the Museum of the American Cocktail is raising funds for hurricane relief at a series of cocktail hours to be held in New York and nationally on Monday, September 12, 5:00 to 7:00 p.m. Participating bars and restaurants will donate proceeds from drink sales to a Katrina relief fund established by the Museum. 2. New Orleans Relief Effort Benefit, New Orleans food, open bar, and live entertainment to benefit relief efforts in New Orleans, Wednesday, September 14, 7:00 p.m, at 366 Columbus Avenue at 77th Street. $30.00/person in advance, $40.00 at the door. 3. When the Saints Go Marching In, a week-long benefit to support relief efforts will be held at participating bars, restaurants, and clubs, beginning on Sunday, September 11, and continuing through Sunday, September 18. Each day as I walk out my front door, my gaze is forced upon a small painting that proclaims "NO MONEY, NO EGGS." Between the words is an amoebic blob of white paint, holding a round yellow center: a perfect egg, sunny-side up. The artist, seventy-one-year-old Alfred "Big Al" Taplet, is a native of New Orleans. Or was. The wrath that Hurricane Katrina wrought on the Crescent City has left behind so much heartbreak; I can only hope that Big Al is not among the many human casualties left in Katrina's wake. What’s certain, though, is while we mourn the lives of so many, we are also beginning to realize the cultural casualties washed away by the storm. For me, this one painting is a symbol of so much—so much that we are only beginning to let ourselves acknowledge. As a documentarian, it is my job to seek people out and listen to their stories. As a documentarian of the foodways of the American South, it is my job to visit with the people of this region who grow, cook, and serve food and drink. Big Al's painting is a reminder of how food is so relevant to the culture of New Orleans—in art, in music, in daily life—and of the continued heartbreak the world will experience as these losses are laid bare. Of course, as the citizens of New Orleans try to find shelter across this great country, they are seeking shelter for their culture as well, bringing New Orleans to all of us. In this we can certainly celebrate. But for now, we are forced to consider the losses. There is never any time like the present in the life of a documentarian; stories are everywhere, and they are always relevant, no matter what the time or place or circumstance. 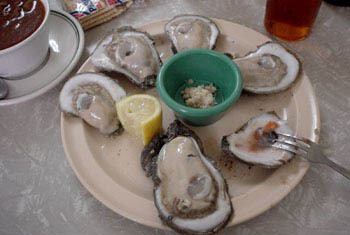 But how was I to know that the ten days I spent in New Orleans four months ago would ring with such consequence today. I went in search of beverages and bartenders, hot on the trail of the city's long history with the cocktail. But now, what has become of the man who made the best Sazerac in town? Or the woman who put everyone else’s Ramos Gin Fizz to shame (a drink which happens to be made using the white of an egg)? Right now, there is a displaced population of survivors without homes, without jobs, with no money and no eggs. 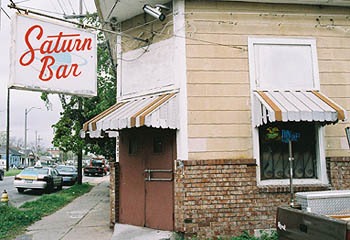 In honor of some of the people and places of New Orleans, The Food Section is featuring profiles of the bartenders and bar owners who were interviewed for the Southern Foodways Alliance's Bartenders of New Orleans Oral History Project. With almost fifty years of bartending under his belt and thirty-four years working at the Rib Room alone, eighty-four-year-old Martin Sawyer has seen it all. He got his first job as a barback at the infamous 500 Club. A bartender friend recruited him for the job so Martin could help him make out drink orders, as Martin was one of the few young men in his circle of friends who could read. 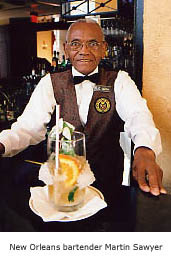 With the nickname "Professor," Martin studied up on cocktails and quickly became a fixture on the French Quarter bar scene. He had his picture taken with Louis Armstrong and served champagne to General De Gaul. With all that time tending bar, it is easy to believe that he would have had a few brushes with celebrity. What's hard to believe, though, is the number of cocktails this man has mixed over the years. With time, care, and a painstaking attention to detail, he has made mixing drinks a high art. All of these years later, Martin still makes his famous Mint Julep with the care and attention he did when he first mixed the drink almost five decades ago. Each fall, the Southern Foodways Alliance (with support from the Fertel Foundation) honors an unsung hero or heroine, a foodways tradition bearer of note, with the Ruth Fertel Keeper of the Flame Award. The SFA pays homage in two ways: we commission a documentary film and we make a monetary contribution. Months before Hurricane Katrina made landfall, Martin Sawyer knew he was this year's recipient, and the documentary film about his life and work is now in post-production. While we are not aware of Mr. Sawyer's fate at present, our thoughts and prayers are with him and the countless others who are part of the service industry in New Orleans. Find out how the Southern Foodways Alliance and other organizations are reaching out to service industry workers in the wake of Hurricane Katrina. Many thanks to Josh Friedland for the invitation to contribute to The Food Section.